The summer months are right around the corner, which means an increased risk of potential heat waves. Though hot weather can make anyone miserable, it can actually be dangerous for the elderly. 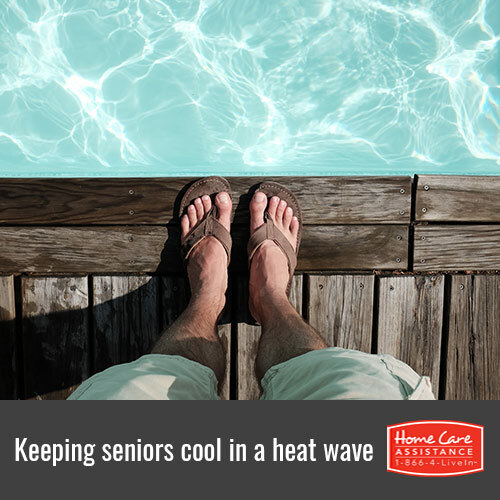 However, there are plenty of ways to help your aging loved one stay cool, comfortable, and safe should the weather become unbearable. The staff at Home Care Assistance, a trusted provider of senior care in Harrisburg, has 4 suggestions to help make this happen. Drinking water isn’t the only way to stay hydrated. Certain fruits such as peaches, pineapples, and melons contain more than 85 percent water. While these fruits are delicious and healthy treats that can help keep your loved one cool, he or she still needs to drink 64 ounces of water every day. Filling a jug with water each morning and keeping it in the fridge is a simple way to track your loved one’s water consumption if you think he or she might not be getting enough. Seniors who live in warmer climates should be wary of how much alcohol they consume. Not only does drinking alcohol raise internal body temperature, but it can also result in dehydration. One full glass of water should be consumed in between every serving of alcohol, and your loved one should have no more than 2 or 3 drinks a day. If your loved one takes prescription medications, he or she should speak with the doctor before consuming alcohol because the combination could damage his or her kidneys. Preparing your loved one’s windows for the warmer summer months is one of the most cost-effective ways to keep his or her home at a consistent temperature. Unlike traditional fabric curtains, which actually trap heat, solar curtains reflect the visible light. These blackout curtains reduce thermal loss by as much as 25 percent and can be installed in moments. If your loved one plans on heading outside during the hottest hours of the day, you might want to call ahead to see which businesses have air conditioning. In the hotter months, malls and indoor markets often have their temperatures set extremely low to draw in customers, and your loved one can take advantage of this free air conditioning. Movie theaters are another great option for seniors who want to cool down and relax for a few hours. Though staying cool in the hot summer months is important for all seniors, some may face challenges that may make it more difficult. If your loved one needs an extra helping hand, turn to Home Care Assistance. Our caregivers can provide transportation, prepare cool, nutritious meals, and help with many other important tasks. We also offer comprehensive stroke, Parkinson’s, and dementia home care Harrisburg seniors and their families can rely on. For more information and to schedule a no-obligation consultation, call (717) 540-4663 today.